I missed the meeting because I was ill, and was very sorry to do so, for Wilkins – like so many of the novelists we read – had the group divided. Some thought (as I did) that he wrote ‘a good romp’ others were unable to finish their novels! 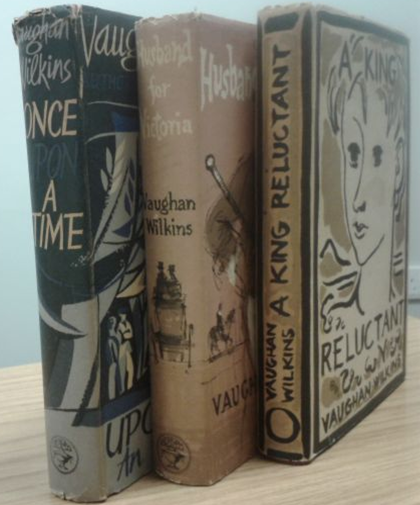 One of Vaughan Wilkins’ novels, A King Reluctant, was adapted as a film called Dangerous Exile (1958). I have read, “King Reluctant,” by Vaughan Wilkins, and find that he fully merits his anonymity. I had never previously heard of him and now understand why. His style is typical of those historical novelists of the 1950’s and sixties – full of platitudes. Wilkins is a third class writer. I think he would be popular in those shop libraries, where you paid a fee to borrow a book in the pre 1960 era. Ouch! Still, the cover of A King Reluctant is delightful. Born Camberwell 1890 (so not Welsh, as wikipedia says). Father – Clerk in holy orders, who had been born in Nottingham. Mother – born in London. 1911 census – mother a ‘professional vocalist/teacher’. WVW – article writer and sub-editor (works on own account). 1916 Army attestation papers – WVW Working as night editor of Evening Standard. Height 5′ 11”. Chest expanded 38′. Assigned as private to RASC: Horse Transport Army Service Corps. Discharged after 56 days. 1926 – still living with his father in Hammersmith. 1930 – married Mary Stanistreet Powell. Died 1959 leaving £2837 (so his novels didn’t make him a fortune, but this was probably a respectable amount in those days). Does anyone else remember this author, or remember their parents reading him? Next, a positive review of a Wilkins novel. Oh goodie – another author I’ve never heard of! Seriously, I love coming across all these obscurities who were obviously thought highly of at some point. Like the names on the back of a book club dustjacket from the 1950s, you have no idea who they are but they sound intriguing. Looking forward to the reviews! Yes, yet another one! And I don’t think we are going to run out of obscure authors for some time! Let’s hear it for obscure authors! I like ‘city of frozen fire’ very much (in translation) and I am searching his other books. As I live in holland, this is a major problem and there seem to be no ebooks. Any suggestions? I read most of Vaughan Wilkins’s historical novels when I was a teenager in the ’50s, learning a lot about 18th and 19th century British history in the process. His fiction contained a good deal of fact, and I owe Mr Wilkins a debt of gratitude for inspiring in me a love of history which has enriched my life. I would so much like to lay my hands on e.g. ‘city of frozen fire’ or ‘once upon a time’, but fat chance for that in the Netherlands. Can you help in any way? uh… I am stupid, they were all available at Amazon.